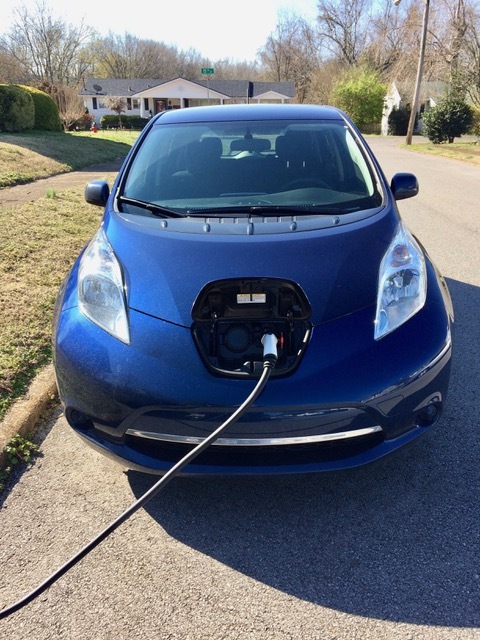 As you know, we purchased an all-electric Nissan Leaf back in January. We absolutely LOVE this car! It is so quiet (no combustion engine), extremely peppy (again no combustion engine), comfortable, tons of room, has great visibility, heated seats, fabulous climate control, and a killer audio system. This is a great commuter car. It has a range of about 100 miles. Each weekday, my husband drops my daughter at school, then me at work, then commutes to school about an hour away. After class, he tops off the charge at the local Nissan dealership, then heads home. When he comes to pick me up from work in the afternoon, we generally stop off at Nissan Stadium to use one of their DC chargers. The stadium is right next to a park and a walking bridge across the river to downtown Nashville. It takes 30 minutes to charge, while we go for a walk, enjoy the park, and catch up on our day. It’s such a nice way to slow down and spend a little time together, just the two of us. Then, we pick up my daughter at school and head home. Once at home, we usually plugin to the house, so that we will have a maximum charge in the morning. The charger than comes with the Leaf is what is called a “trickle” charger. It plugs in to a regular household outlet, and would take almost 24 hours to charge the car from empty to full. We are usually at about 60% charge when we arrive home, so plugging in overnight works just fine. I realize that it sounds like a lot of charging and hassle, but in reality, it has quickly become routine, and is no more of a hassle that driving out of the way to go to the gas station. Even my daughter knows how to plugin the car. We save about $300 a month on gas, which goes towards the car payment, and have really not seen any change in our electric bill (though it had only been a couple of months). Additionally, a few years ago, I opted in to a program that our electric company offers which draws our electricity from clean sources such as solar, wind, and hydroelectric. So our electric car is truly running cleanly! We have street parking only at our home, so leaving an electrical cord running from the house to the street every night is not ideal. I was mainly concerned that someone would trip over the cord while walking their dog in the wee hours of the morning. We purchased a caution yellow cord protector to cover the cord on the sidewalk and make it more visible, but we still wanted a better solution. 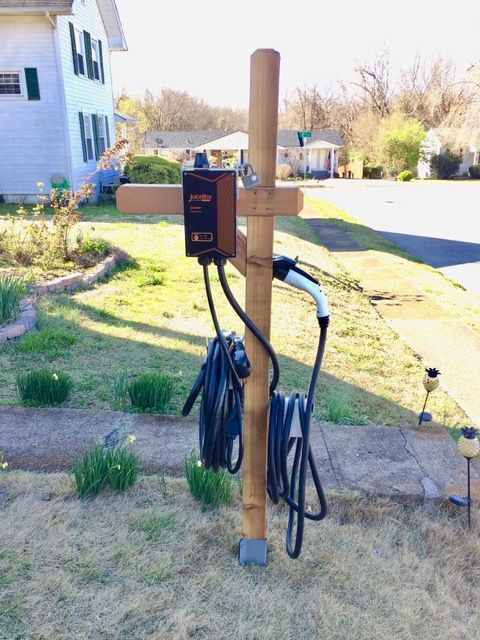 We decided to purchase our own L2 (level 2) charging station, so that we would not have to leave the car plugged in overnight to charge. After some research, we purchased a JuiceBox Pro 40 from eMotorWerks. The system gets excellent reviews and offers one of the fastest charge times among home chargers. The JucieBox requires a 240V outlet, like the kind used for an RV or a dryer. 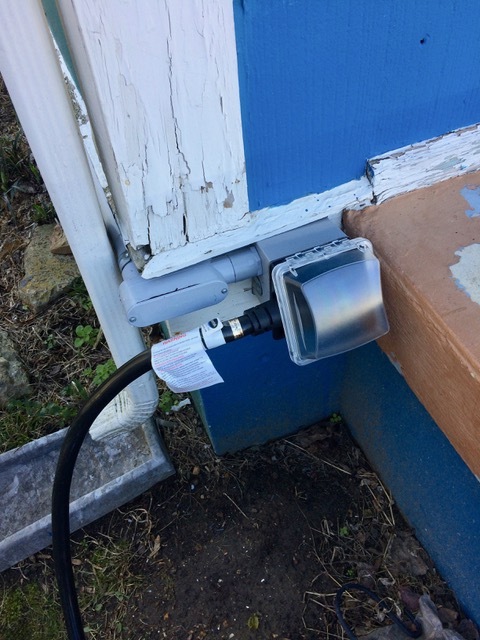 So we called our electrician to have a 50A 240V NEMA 14-50 outlet installed on the outside of our house, near the front porch. The length of the charging cord on the JuiceBox is 25-feet, which only got us from the car to the middle of the front yard. 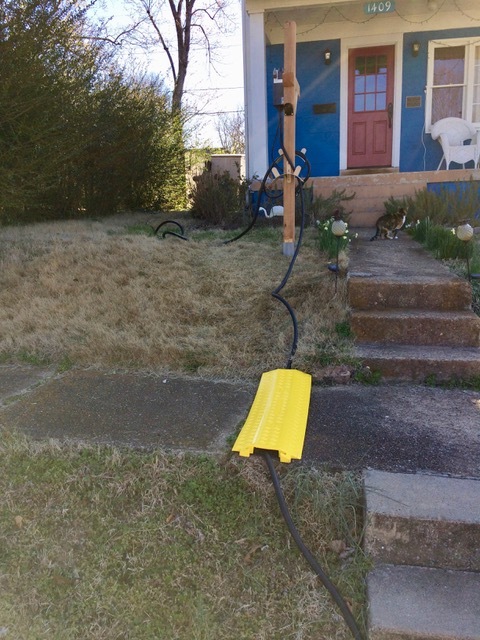 So we purchased a 25-foot 50A extension cord to run from the house to the charging station in the front yard. Using an extension cord with a charging station is generally not recommended due to the drop in output that will occur, but some online research confirmed that many people are using this configuration successfully. We installed a mailbox post on which to mount the charging station. 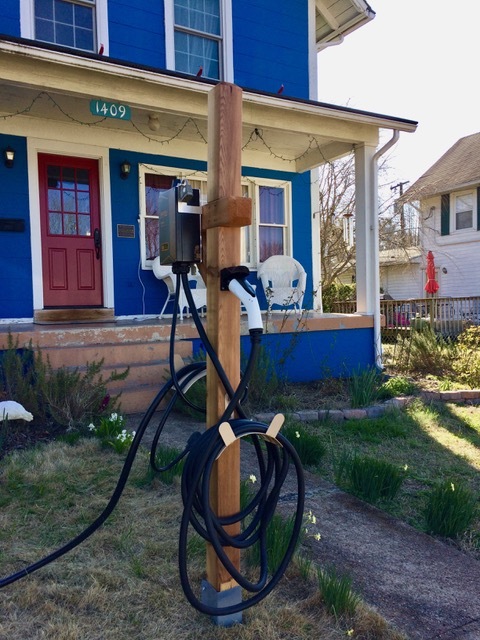 On the post, we mounted two garden hose hangers, once for the extension cord and one for the charging cord. To charge, we uncoil the extension cord from the post, and plug in to our 50A outlet. The extension cord has a light on it to indicate that it is receiving power. The box is installed under the porch overhang and has a protective cover to keep out rain. The charging station post has a charging nozzle holder, like a gas pump, to hold the charging nozzle. We remove the charging nozzle and plug it into the L2 outlet on the car. Look how happy she is! Then we cover the cord where it crosses the sidewalk with our yellow cord protector. This protects the cord and hopefully warns pedestrians to watch their step. The L2 charging station can charge the car from zero to full in 5 hours. Since we rarely arrive home at zero, we can plug in when we get home around 6:00 pm and be done charging by the time we go to bed. The charging station can be removed from the post easily, in the event of a bad storm or if we go out of town. Now we can enjoy quicker charge times at home and not be worried about leaving the car plugged in overnight!